One of the slides contained a couple of legs of a garden spider (Areneus diadematus). I knew that just one leg contains many interesting features. 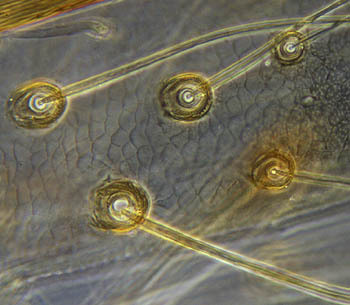 In this article I like to show you some of the things you can find on a single spider leg. 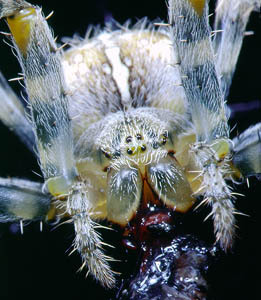 The garden spider belongs to the orb-web spider family (Araneidae). It catches its prey with a large web. It does not rely that much on its eyesight (which is rather poor) but more on organs that can sense the slightest trembling of the web. It is not strange that the legs contain many sensors that can detect such vibrations in the web. It is easy to demonstrate this by holding a tuning fork against the web. The spider will leave its retreat thinking its the beating of the wings of an insect. But what do these receptors look like? The spider's leg is obviously very hairy. Almost all these hairs are sensory hairs (in fact they are more like bristles), and act as receptors that can detect touch and vibration. There are several types of sensory hairs. You can identify them by the way they stand in their socket. The large tactile hair above emerges obliquely. 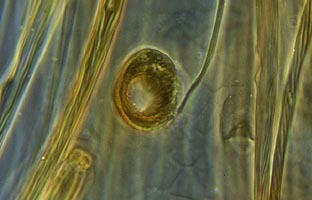 There are also much smaller so called trichobothria (they project vertically from their socket). They are extremely sensitive to air currents or low frequency air vibrations. Spiders can sense a flying insect from several centimetres. Some spiders are able to detect and catch a flying butterfly in mid-air. There are also chemosensitive hairs, the tip of the leg contains a series of these hairs the spider uses to taste. There is also a whole variety of other receptors. So-called slit sensilla and lyriform sensilla can be found all over the leg (most lyriform organs are situated close to the leg joints.) With these sensilla the spider senses it's own movements but they also enable it to detect sound. Each slit has a thin membrane in which we can see a small dot. This is a dendrite. This nerve cell detects deformation of the slit. Rather difficult to find is the tarsal organ. It is a small spherical pit situated near the end of the leg (the last segment called the tarsus). They are supposed to detect odor as well as humidity. (Image of tarsal organ taken with 40X obj. Within the legs I could also see the long tendons for the movement of the limbs. The legs are stretched because they are under pressure of body fluids. The spider only has to pull the cord to bend the leg. But I saved the most spectacular part of the spiders leg for last. 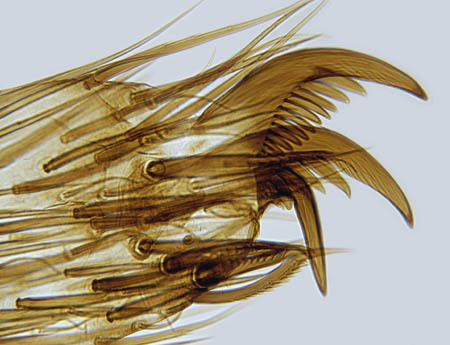 The foot of a spider is a very interesting object to study under the microscope. You can see how the garden-spider is able to cling to the threads of its web. The foot possesses two claws, one downward pointing hook and several serated hairs. 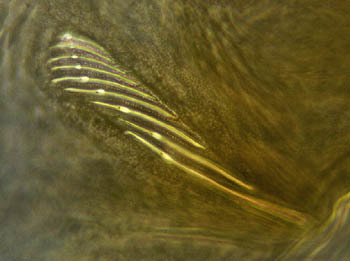 The hooked claw grabs the thread and the serated hairs hold the thread in the hook. There is a difference between web building spiders and spiders that stalk their prey like wolf-spiders and jumping-spiders. These don't possess the hooked claw. But they often have tufts of hairs on their foot that enable firm adhesion to a surface by means of capillary force. Since spiders are easy to find and abundant it is not difficult to study these interesting creatures. If you like to study a prepared slide like I did, go to the OnView Shop to order spider legs or whole mounts of spiders and insects. Michael J. Roberts, Spiders of Britain and Western Europe. Published in the January 2000 edition of Micscape Magazine.